New Authors: Learn to use the tools on Amazon! Here's a major adventure for mid-schoolers! This new release by R. W. Garrett compares favorably with the tales of C. S. Lewis. In fact, Garrett acknowledges his influence in her work. The story centers on the Chosen Children, set apart by the Unknown God to populate three small islands north of the main continent of Atlantis. While the purpose of the divine directive is one of mercy and survival, the crafty and unscrupulous King Jorash seeks to twist it to his own liking. The Children reach the appointed age of 14, and their training begins. Adult mentors teach them all aspects of community: government, construction, farming, mining, etc. But when the priests cast lots to choose the youthful king for this new country, it falls on the earnest, conscientious Savot, not Cain, the boy who shares the king's agenda. Thus, during the year of training, King Jorash plots with Cain and other like-minded boys to get rid of Savot and run things their way. The time comes when the Chosen Children voyage to their new home and are left on their own. Though they now face very grown-up challenges, responsibilities and dangers, Garrett never forgets that they are kids. Pranks, antics, and youthful dialog abound. This is a complex adventure, but Garrett tells it simply, and in language appropriate for the target age group. There is plenty of suspense and excitement to keep the reader involved. The ending, while satisfying, leaves ample material for a sequel. Lets hope it comes soon! This may be one of my more interesting blogs. Not because of the subject matter particularly, but because I’m dreadfully high on pain meds at the moment. Twisted something during aerobics this morning. My sweet, solicitous husband offered me of his prized prescription post surgery pills – Vicodin, I think it’s called. Since I rarely take anything stronger than aspirin, and rarely take even that, I’m having quite a reaction. I mean, I even feel disconnected from my tongue. But this is NOT what you tuned in to hear. Last week I talked about Search Inside the Book. Or, as those of us already Inside call it: SITB This time I want to tell you about another neat way Amazon offers to enhance your listing: the Author’s Page. It’s announced (with your photo) just ahead of your first book. Begin with Amazon’s home page, and enter “Author Central” in the search window. No, no, don’t type in the quote marks! Geeez. That was just for illustrative purposes. Follow the instructions for entering your books, bio, photo and whatever. After you submit the info, they’ll reply that they’re building your page and will get back with you within 7 days. Parts of it may appear before others. Don’t panic. Be patient. Seven days, remember? I’ve barely scratched the surface with mine so far. You can link it to your blog and website, add a string of photos, etc. There’s just lots of cool things you can do there to entertain and tantalize your fan base. Take advantage of every tool you can find. Remember, the more readers can learn about your book, the more apt they are to buy it. 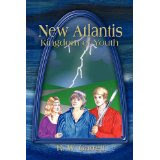 A great new kiddie book hit the market last week: NEW ATLANTIS: Kingdom of Youth. The author, R. W. Garrett, wrestled a compelling cover from the publisher, but I can’t show it to you because the Amazon listing doesn’t have it! This I discovered when I went to the site to post a review. Horrified, I rushed her the link to Amazon’s Seller Central, the one I use to add “Search Inside the Book” to my own listings. They have instructions for submitting your files: front cover, back cover, and text block. But when SHE clicked the link, it went to a whole different world of advertisements and pricey packages – no resemblance to anything I was seeing. At my suggestion, she typed SITB in the Amazon search window. No luck. I was stunned. It’s so easy. I’ve done it with the 3 books I now have in print. Finally it hit me. When I click the Amazon link on my faves list, it “knows” me and displays accordingly. It knows what I mean by Seller Central even though it’s called something else now. Sigh. So next time I went in from scratch – typed “amazon.com” into my ISP’s search window and went in as a stranger. After a bit of scrounging, I finally found it. You may want to take notes here. 2. Scroll all the way to the bottom. You’ll see 3 columns of lists. 5. Another display magically appears. The obvious choice here is: >> Search Inside! 6. Click that and follow the instructions. The NEW ATLANTIS author emailed back in short order: “It worked!” Whew. Next week: Creating an author page on Amazon. 1. I will NOT refuse to have my hair washed even though I’ve gotten along fine for two months and become eco-system for fleas, lice, ticks, ants, and spiders. 2. I WILL choose to be cheerful. Raging against everyone and everything because I’ve gotten old won’t change anything. Plus it wastes precious energy. 3. I WILL accept that other things exist in the world beside my stupid aches and pains. In fact, listening to the news and/or taking an interest in others can actually distract me from them. 4. I will NOT refuse basic hygiene even though I may have figured out by then why crabby old folks hate being clean. 5. I WILL change my hearing aid batteries regularly. 6. I will NOT regale all and sundry with my bowel activities. Ditto the arthritis. And my latest surgery. 7. I will NOT make every statement a complaint. 8. I WILL thank people for their efforts, even if I must (politely) pass on the Cajun crawfish with fire sauce they have prepared for me. 9. I WILL acknowledge that certain aches and limitations come with age and stop running to doctors and taking a gazillion pills trying to be “normal” again. Notice that half the meds are to correct the side effects of the other half. 10. I WILL cultivate a pleasant disposition so it’ll be habit by the time my mind goes. I WILL be like my 102-year-old Aunt Vivian who’s a joy to be around even though she constantly repeats herself. 11. Lastly, I will NOT keep griping that I don’t care about anything and just want to die. An exasperated great-grandkid just might ruin his life accommodating me!